On the Job Accidents – What to do? Miami and North Miami Beach Personal Injury Law Firm serving employees that have suffered personal injuries and the families of those that have fallen victim to wrongful death while on the job. 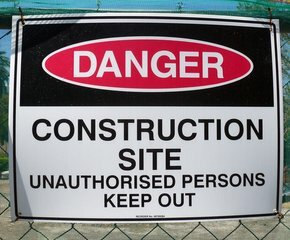 Miami: Construction workers spend a lot of time in the presence of danger and face an array of hazards despite the many safety precautions taken to prevent personal injury at construction or industrial worksites. Miami accidents involving heavy machinery most often lead to personal injury and many times are the result of negligence by either the employer or the employee. Nonetheless, there are laws that insure compensation regardless of fault, mainly because the severity of the injuries that involve negligent use of heavy machinery may sometimes involve life-altering consequences or may even result in wrongful death. One such incident occurred this past Saturday when a worker at an industrial worksite in West Miami-Dade, fell into an asphalt machine and experienced an agonizing death. The authorities are investigating what caused the worker to fall into the machine which took his life. In another recent tragedy involving heavy machinery and asphalt, an elderly paving machine operator with 30 years-on-the-job experience was crushed after he fell off the machine while paving the parking lot of medical facility construction site in Miami-Dade. These are just a couple of the many tragedies and accident incidents that take place all the time at construction sites in and around Miami. There are reasons why warning signs are posted all about, as well as hard hat areas, barriers, etc. Nevertheless, dangers such as risk of electrocution, falling from high altitudes, contact with endangered substances, and other long-term injury from being exposed to toxic elements for extended periods of time all lurk at construction sites. PERAZZO LAW FIRM INSIGHT FOR FILING WORKERS COMP. Filing and litigating for compensation from construction accident lawsuits can be quite complex in Florida, basically because many times it is difficult to determine the party liable for the work-related accident and the specific injury claims by the worker. Many times there may be disputes on behalf of the worker’s and/or the employers insurance providers. Victims of work construction accidents may be eligible for medical compensation, which may be offered to them by the construction firm’s insurance providers and may include time-off for full recovery from injuries that require rehabilitation. In the event of wrongful death or permanent disability, the insurance provider may offer a settlement. In any case, it’s always best to hire a professional personal injury lawyer. If you, and family member or loved one has suffered personal injury or loss as a result of an accident involving heavy machinery or an unsafe worksite, the personal injury lawyers at the Perazzo Law Firm’s North Miami Beach and Miami offices urge you to contact us Online or Call (786) LAWS-411 to receive a FREE initial consultation and the best advice for dealing with workers claims for compensation after a job related accident.